CM Magazine:Learn Along With Lily. Donna McNaughton. Illustrated by Mike Motz. New York, NY: Raindrop Books, 2008. 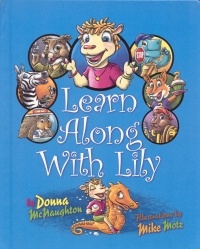 Lily is a wide-eyed nanny goat kid who introduces 13 preschool topics ranging from colours to community workers. Told entirely in rhyming verse, some concepts are not clearly presented for the intended audience. For example, in You can Count on Lily, the lesson seems to be learning to count to five. However, in the poem, a mix of number words and homonyms are highlighted in bold: Shes never too busy/ to sing or to play./ Try Tuesday at two oclock/ or even today. 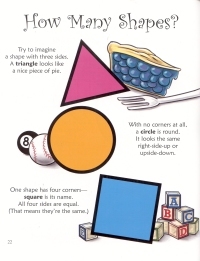 The illustrations might also cause confusion. Lily is shown on a unicycle with the number one on her shirt. A fox with the number two is balanced on her shoulders. They are holding cupcakes numbered from 1 to 3. The other illustrations do not include numbers. In Do you know your opposites? readers are asked: The sun comes up each morning/ and goes down every night./ The world is always turning - but is it left or right? The cartoon illustrations show Lily waking up and going to bed, but the position of the sun remains in almost the same place. Manners and socialization skills are also promoted. Lilys anthropomorphized appearance is described in Everybody has a Body. She has two eyes to see,/ a cute nose underneath,/ two ears to help her listen,/ and a smile of clean, white teeth. The message of acceptance is plainly stated: In some ways we look different,/ but were pretty much the same. Interspersed throughout are short narrative pieces, including Lily's Rodeo and Feeding time at the Zoo. These fun vignettes are told with humour and imagination. While the book is intended to be used as a educational tool, the entries that are the most successful are the ones that do not try to instruct.